She called for "dialogue toward a political solution." Foreign Affairs Minister Chrystia Freeland speaks at a news conference about the start of NAFTA renegotiation at the Canadian Embassy in Washington, D.C. on Aug. 16, 2017. 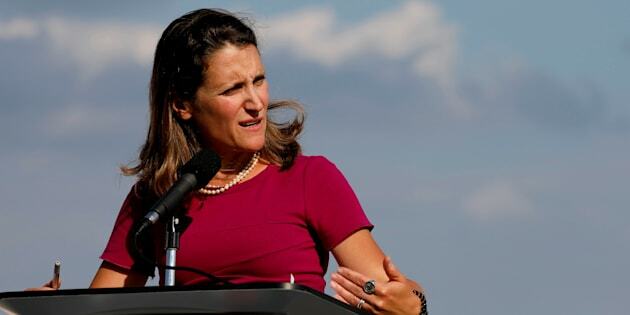 OTTAWA — Foreign Affairs Minister Chrystia Freeland says North Korea's latest provocative missile test is a reckless violation of Japan's sovereignty. By firing a long-range missile over Japan that landed in the northern Pacific Ocean, North Korea is showing a total disregard for its international obligations, she said in a statement Tuesday. "North Korea's reckless violation of its neighbours' territorial sovereignty and its direct threat to Japan's citizens have threatened both regional and international peace and security," she said. Freeland called on North Korea to "resume dialogue toward a political solution." The latest in a series of missile tests came as South Korea and the U.S. conducted war games in the region. U.S. President Donald Trump says all options are on the table and he had a 40-minute conversation with Japanese Prime Minister Shinzo Abe. Last week, the House of Commons defence committee held a rare summer sitting to discuss the North Korea situation and to discuss whether Canada should consider joining the U.S. ballistic missile defence shield for North America. Prime Minister Justin Trudeau, who is hosting Jordan's King Abdullah today, has said Canada has no interest in joining the controversial program that successive governments have opted out of for more than a decade. Prime Minister Justin Trudeau speaks with King Abdullah ll ibn Al Hussein of Jordan on Parliament Hill in Ottawa, Aug. 29, 2017. Trudeau told the monarch that Jordan and Canada are good friends and share a desire to have a "positive impact in the world" on security and refugee issues. Canada's recently released defence policy acknowledges the threat posed by North Korea, but does not specifically address missile defence. "The number of countries with access to ballistic missile technology, including some with the potential to reach North America or target Canadian and allied deployed forces, has increased and is expected to grow and become more sophisticated," the policy says. "North Korea's frequent nuclear and missile tests underscore this point."